Hall Tank is known for building quality steel tanks. We maintain a 100% STI quality rating after all 2009 audits. We’ve built thousands of tanks using only the best materials and craftsmanship in our North Little Rock, Arkansas plant. 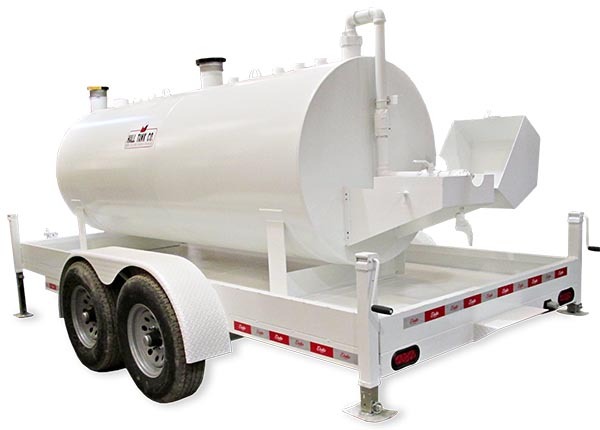 The Relocatable Fueling Unit is the answer to your on the go fueling needs. It comes complete with fueling storage, piping for dispensing and can be transported from location to location with ease. Available from 359 gallons to 2,000 gallons. Trailer is made from 2”x3” tube and angle. For jet fuel, diesel, bio-diesel fuels and any other combustible fuel. 1 – Piping for filling tank complete with dust cap & quick disconnect coupling. 1 – Piping for emptying tank complete with dust cap & quick disconnect coupling. Exterior is primed red oxide & finish painted aluminum.